Since those papers were published, I have expanded the use of Lean principles and practices to the design and delivery of my courses. I had made a lot of improvements since 2004 and wanted to inform people of them. So, I wrote The Lean Professor and published the first edition in June 2013. The second edition was published in December 2013 reflecting additional improvements. 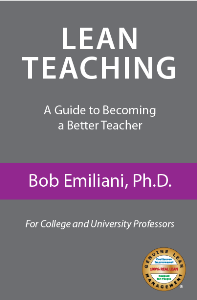 The paperback edition was published as Lean Teaching in 2015.